Water, Sanitation and Hygiene Partnerships and Learning for Sustainability (WASHPaLS) with the support of USAID is seeking Expressions of Interest (EoIs) for its Grant program “Habit Formation Approaches and Gender Equity & Social Inclusion Innovations for Hygiene Behavior Change” to support learning related to the application of habit formation and GESI principles to hygiene behavior change (HBC). WASHPaLS anticipates awarding up to four (4) grants from this solicitation. Awards are anticipated to range from $50,000 to $300,000. In accordance with Automated Directives System (ADS) 302.3.4.13, U.S.-based organizations are limited to $100,000. It is anticipated that the duration of the grants will be 12 to 18 months, but may be longer depending on the technical scope of work. Eligible Applicants should submit an EOI following the format provided in Attachment A. EOIs should not exceed (3) three pages (not including the cover page) and must contain the information requested in Attachment A. EOIs that do not follow the format provided or are late will not be evaluated. Applicants may submit multiple EOIs in response to this REOI under one or both focus areas, but no more than one EOI per organization will be recommended for preparation of a full application. Please insert the following text into the subject line of the submission email: WASHPaLS EOI-001. For more information, please visit WASHPaLS Grant program. 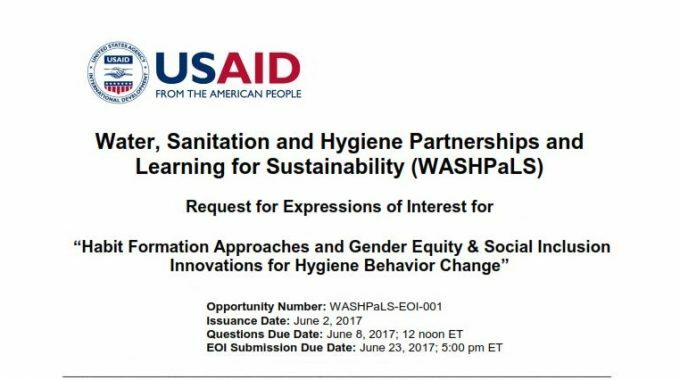 Additional information including the application format is available in this WASHPaLS EoI Document for download.